The past 48 hours brought up to 1 meter of snow fall and with it a-lot of disruption here in Verbier and surrounding areas. 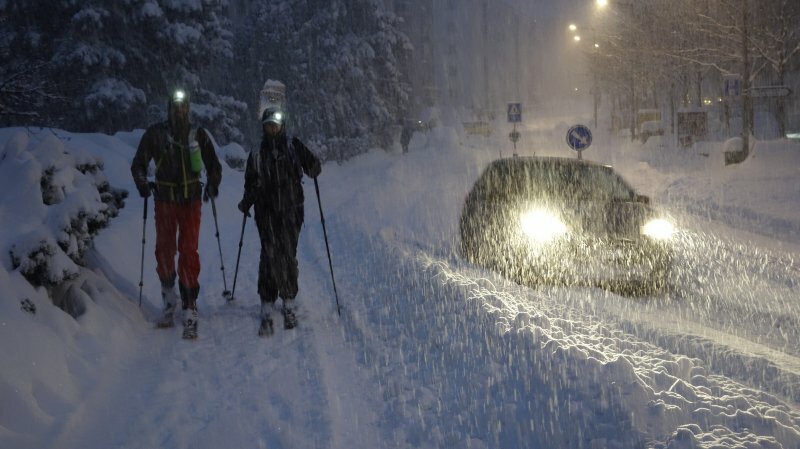 The whole canton of Valais was snowed in and shut off from the world on Sunday. All trains were cancelled, unheard of in a country with an impeccable rail system. 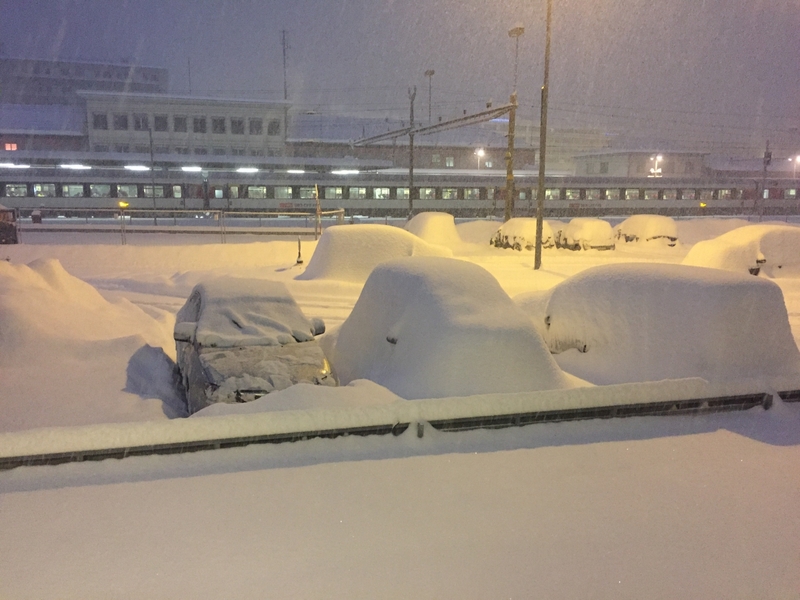 1 train load of 400 passengers in particular were stuck on a frozen track for 5 hours before being evacuated, even then half were stranded due to the closed roads and 200 people spent the night in a school cafeteria in Vaud. Parked cars were completely lost and abandoned under a thick duvet of snow and even the accustomed road clearers couldn't keep up with the volume of coverage, vehicles were seen veered off local roads and part of the motorway was closed with motorists stuck for hours in their stationary vehicles. Allow for extra time when travelling and check travel updates regularly. Think about some practical additions to your usual luggage if driving e.g. a shovel in your car, warm blankets, bottles of drinking water, a local map, a battery operated mobile phone charger and a torch. Snow tyres and chains are a must. The avalanche warning is at level 4, High risk so great care and regard for safety is required for anyone enjoying the epic powder on the mountain. Ensure to respect all safety warnings and be prepared with the correct safety equipment and knowledge should you need to deploy it. Above all stay safe and enjoy this historic start to winter! Last Saturday 2nd December saw the official opening of Verbier 4 vallees although many of the ski lifts and slopes have been open since early November due to the excellent early snow fall. Once again Televerbier offered a special celebratory Free day of skiing to anyone dressed up as Father Christmas. One of the highlights of the day was the attempt to beat last years group photo record of 1,200 santas snapped at Chalet Carlsberg. 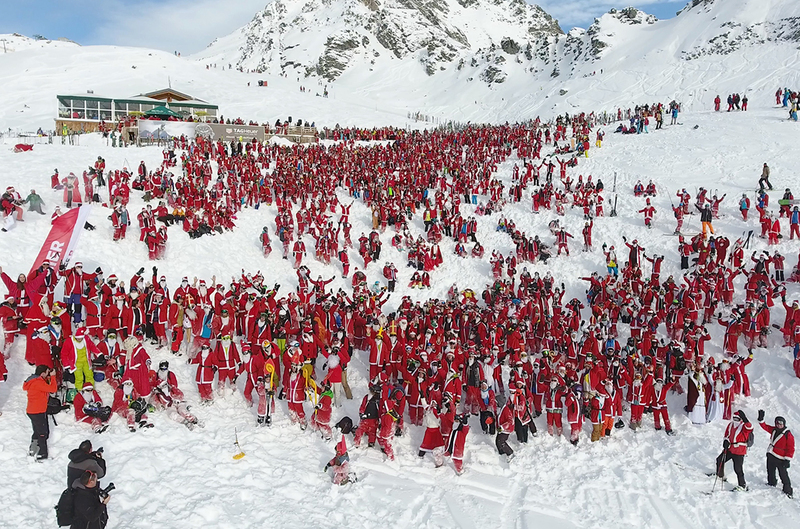 The record was well and truly smashed with over 2,656 skiing santas attending the photo shoot making for the largest photographed group of Père Noëls ever gathered in Switzerland, validated by the Guiness book of records. You can still claim your 2 for 1 voucher on your next Verbier day ski pass here if you didn’t receive it on the day at chalet Carlsberg. You will also be entered into a prize draw to win a seasonal ski pass for Verbier, Closing date 16/12/2017. Talking about distinctive red uniforms.. the Swiss Ski School are offering their own early season initiative with their ‘Test our ski instructors’ offer. 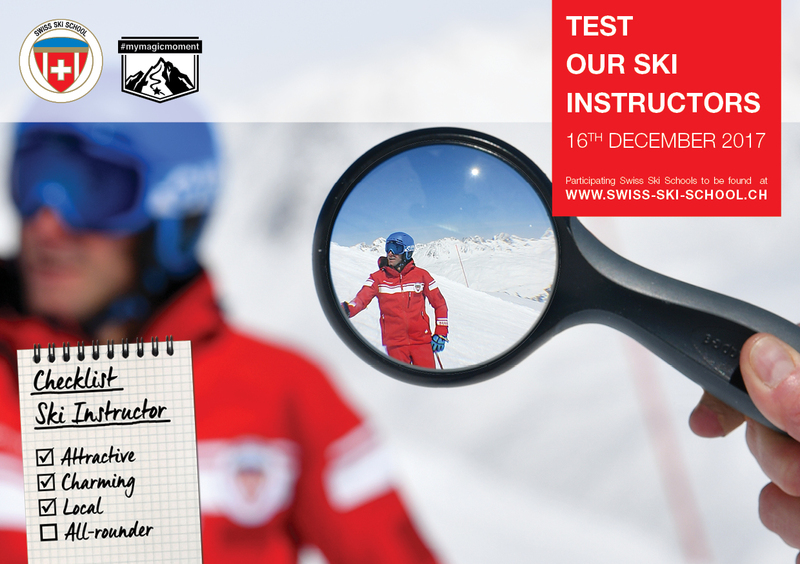 Over 80 ski stations across Switzerland will participate on Saturday 16th December with the instructors from the red school on hand to provide an accompanied track or two with visiting skiers. They will provide free ski tips and advice on your technique directly on the slopes, don't miss this excellent opportunity to benefit from their skill and expertise. No booking is required, it is simply a case of turning up on the day between 10:00-15:00 and pairing up with an available instructor. Please click for the full list of participating ski stations. Christmas has come early to Verbier! Or so it would seem with the first of the resorts ski slopes opening on Friday 10th November and even more ski lifts and pistes now up and running. The lifts are open every weekend in November until after the official opening day next weekend. Lac des Vaux was the first area to welcome eager first skiers and was quickly followed by La Chaux and Attelas (James Blunt). Televerbier, the company that manage and operate the ski lifts have invested a staggering CHF 20,000,000- upgrading the 4vallées network. 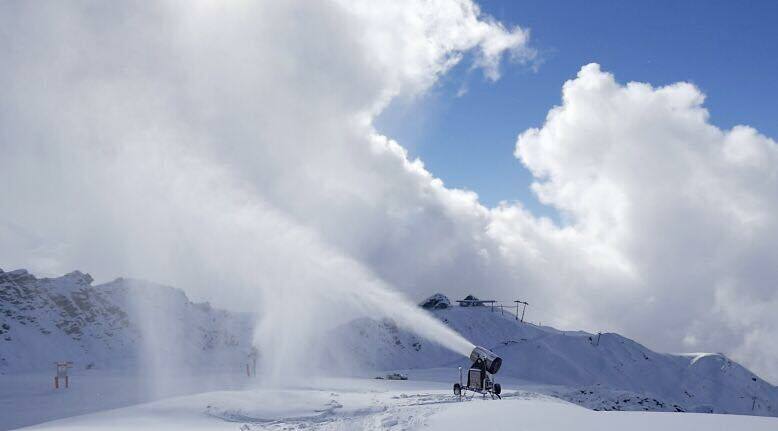 60% of the 435km of pistes are now covered by state-of-the-art snow canons and the snow making is so extensive that Televerbier can open up five major ski areas; Lac des Vaux, La Chaux, Bruson, Attelas-Ruinettes and Gentianes-La Chaux with 100% artificial snow. To celebrate the start of 2017/2018 winter season on Saturday 2nd December, Televerbier are offering everyone dressed up as Father Christmas the chance to ski for FREE! At last year's event 1,600 santas whizzed down the slopes of Verbier for the opening season. All participants receive a free ski pass, special train to Le Chable station with a limited number of places, coffee and a croissant, aperitif, photo, mulled wine, raclette and apres-ski fun. 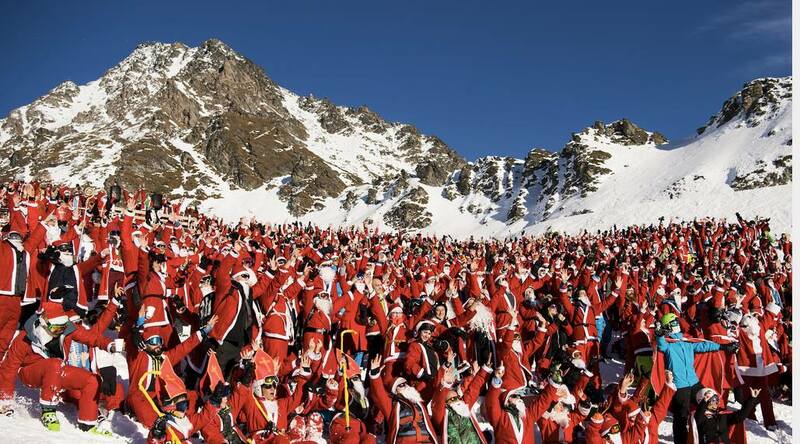 Meet at 2:30pm at Chalet Carlsberg for the group photo where an attempt will be made to beat the world record for the largest gathering of Santas on a ski slope! Everyone who turns up for the photo will receive a 2 for 1 voucher and will automatically entered into the prize draw for the chance to win a Verbier 2017/2018 season pass. Festive fun for all the family! If you are planning to visit Verbier to have the best ski vacation, you need to equip yourself with a few tips. First of all, you need to have ski gear that fits you properly. However, you can also rent out ski gear here in Verbier or inquire if your chalet rental will be able to provide you with that service. You also need to have a basic understanding of skiing and maneuvering around the slopes to have a more enjoyable experience. Your ski chalet in Verbier might also have a private instructor onboard, but if not, there are some great ski schools here that can provide group or private lessons. Some of the most important things to keep in mind when skiing in Verbier, are the things that could go wrong. 98% of the time, skiers end up in trouble because of small mistakes that could have been easily prevented. One of the most common mistakes that skiers tend to make is look down on their skis while skiing, consequently losing sight of what’s ahead. Whatever you do, always try to keep your eyes open and stay alert. You cannot afford to lose sight of the slope ahead. If you know how to drive you might also know that turning your car on snow or an icy road in an effort to make it stop is not something you want to do. Similarly, while skiing try to use the hill slope to your benefit. People who have been skiing for years also take the ‘easy’ slopes before they head all the way up to the top of the resort. This helps warm up the body and get it ready for more challenging skiing. Try to ski around easy slopes and only go to the top when you trust yourself and feel ready. You should never rely on your friends or family members to teach you how to ski unless they are licensed instructors. When you plan on skiing in Verbier find a private instructor or group lessons that can turn you into a pro within a few days time. Many beginner skiers believe that they need to turn their bodies completely in order to make a sharp turn. However, that is not the case and might result in an accident. Use your weight to exert force on the skis to turn. These are just a few mistakes you should avoid to make the best out of your ski experience. If you are looking forward to renting out Verbier ski apartments, be sure to contact us at Active Fusion.and we will help you organize the perfect ski instruction as well as your perfect accommodation. Although many tourists prefer to come down to Verbier in the winter due to the excellent weather conditions for skiing here, the resort is not limited to winters. You can also have the same enjoyable experience when you choose to visit Verbier in the summers. The resort’s strategic location and the number of different facilities here make it a perfect spot to indulge in some summer fun. A highly refreshing summer activity to do in region close to Verbier is to slide and slip your way down the canyons. You will love the natural obstacles and water slides that add adventure to canyon exploring here. Although it is not suitable for younger children, anyone above the age of 10 can have fun here. Get a professional guide to accompany you to make the best out of your canyon filled experience. There are two golf courses in Verbier surrounded by the spectacular views of the mountains. Excellent courses and mesmerizing scenery will surely add a special touch to your golf game here. Horse riding is another popular summer activity here which allows you to enjoy the remarkably views from horse back. The Verbier equestrian centre offers lessons for all ages. If you are a fan of adrenaline rush inducing activities, you will surely love white water rafting in the River Dranse below Verbier! It is the most exhilarating way to come down a river in a large inflatable raft. All the equipment you need e.g. wet suit, a safety helmet, will be provided by the rafting company. Mountain biking in Verbier is a unique experience; the whole region is still accessible in the summer using the lift system and can be even more fun than winter! There is a lot around Verbier to explore and the trails vary in difficulty and abilities so that there is something for everyone. These are just some of the summer activites you can take part in, here in Verbier. If you are looking for an unforgettable experience here, be sure to contact us and let us help you plan your visit! Need to relax and unwind? Verbier has a lot to offer! If you are planning to visit Verbier this holiday season then you better get ready for a lot of fun filled activities. You can do anything from skiing, paragliding, and mountain biking just to name a few things. However, a vacation is never complete when you don’t get to have the ‘You’ time. That’s right, you need a place to relax and unwind to calm down your nerves and there is no better place to do that than the spas and wellness centers here. The best part about Verbier is that a majority of the vacation and apartment rentals are filled with the complete spa experience. At the end of the day when you get off the snow, you can enjoy a relaxing session in your balcony Jacuzzi or let your body detoxify in a steam room. You can click here to find out vacation rentals that come with their own spa facilities. A number of luxury chalets in Verbier offer complimentary massages during the week while some offer them on the weekends. You can inquire about this before coming down or you can also conveniently setup an appointment for a massage whenever you wish! Lavey les Bains and Les Bains De Saillon are two thermal resorts that are easily accessible from Verbier. You will definitely love taking a day off from all your activities in Verbier and dedicate it to all the massages, steam baths and beauty treatments here. If you are looking for an even better experience, you also get the chance to dive into hot water coming in straight from the Swiss Alps at 51 degrees celsius. If you are passionate about your health and your fitness routines and you don’t plan to give them up on your vacation. You will enjoy visiting Wholey Cow. It has some of the best instructors and therapists in town that guide you to help regain mental and physical focus while pursuing your fitness goals. Verbier is the number one tourist spot to relax and unwind! If you are looking for a chalet spa in Verbier or other rentals, be sure to contact us at Active Fusion. Five apartments in Verbier you simply can’t miss! Do you like to have your dose of adrenaline when on vacation? Check out the adrenaline rushing extreme sports in Verbier! 5 super luxury and heavenly private chalets in Verbier! Check out the top three luxury rentals we can get you at Active Fusion! Copyright © 2014 activefusion. All rights reserved.